In this paper we examine the relationship between presidential patronage and federal agency performance. 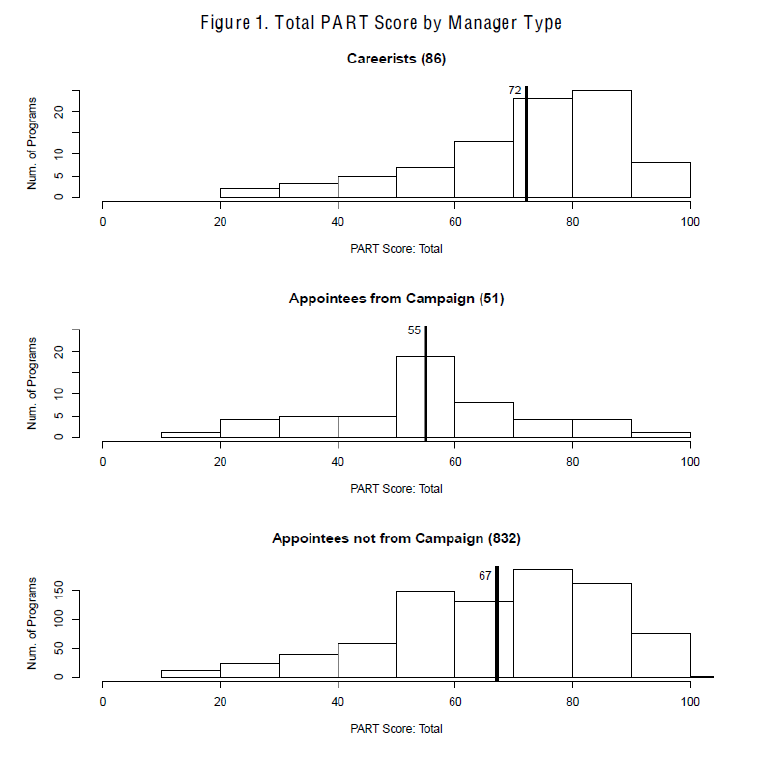 Using PART management scores for 1,016 federal programs during the Bush Administration, we compare the performance of federal programs administered by appointees from the campaign or party against programs run by other appointees or career professionals. We introduce new means of overcoming the shortcomings of PART scores in order to make reliable inferences from this measure of federal program performance. We find that federal programs administered by appointees from the campaign or party earn lower PART scores than programs run by other appointees or by career executives. We conclude that while appointing persons from the campaign or party provides presidents an important source of political capital and arguably improves accountability, it also has costs for agency performance. You will recall that in January 2012, President Obama named Richard Cordray to head the Consumer Financial Protection Bureau and three new members to the National Labor Relations Board, all by recess appointment. The catch was that the Senate was not in recess—or at least said it wasn’t. Since 2007, originally in response to George W. Bush’s aggressive use of recess appointments (he made 170+ ) and then via Republican pressure after Obama took office, the Senate has held brief pro forma sessions even during periods of legislative inactivity, purportedly preventing Senate recesses of sufficient duration to allow for recess appointments. The Obama administration argued that since the Senate did not – perhaps even could not (there is some dispute here) – conduct regular business during these sorts of sessions, it was not available to perform its advise and consent function. Thus it was de facto in recess and such appointments could in fact be made. Sarah Binder’s post from the time detailing this is here; Nolan McCarty’s take is here. Much useful background may also be found in this CRS report on the subject. Indeed it does, at least to the court’s logic, and potentially to the recess appointment power. According to the ruling, “The Recess” must be the period between Senate sessions—thus, during the interim between (say) the 110th Congress, 1st session, and the 110th Congress, 2nd session, provided that the Senate has adjourned, sine die, in between. Despite the fact that intrasession appointments have occurred since 1867, and with some regularity in the postwar era, the court’s decision declares that practice off limits. I tend to agree that the Obama administration overstepped. In its memo a year ago, the DOJ’s Office of Legal Counsel concluded that “the President… has discretion to conclude that the Senate is unavailable to perform its advise-and-consent function and to exercise his power to make recess appointments.” As the court responded, “This will not do. Allowing the President to define the scope of his own appointments power would eviscerate the Constitution’s separation of powers.” Was the president acting rationally, in the face of opposition obstructionism? Certainly. That doesn’t mean his actions were legal, or should be applauded. On the other hand, to retroactively impose a definition of “recess” that goes against 145 years of practice is itself overreach. While the DC Circuit’s opinion is drenched in the judiciary’s favorite self-congratulatory perfume – Eau de Marbury v Madison – its logic is perhaps not self-evident. Note that there is an 11th Circuit Court of Appeals ruling from 2004 (when Democrats in the Senate challenged a judicial recess appointment made by President Bush) that upheld the appointment (in quite different circumstances, when the Senate was indubitably in recess, albeit not between sessions.) That decision held explicitly that “the text of the Constitution does not differentiate expressly between inter- and intrasession recesses for the Recess Appointments Clause” (p. 8). CRS notes more broadly that while there is more controversy over intrasession recesses than those between sessions, “through interpretation and practice, a ‘Recess’ for purposes of the Recess Appointments Clause encompasses both the inter- and intrasession recesses of the Congress.” (The DC Circuit dismisses out of hand the 11th Circuit’s reasoning, even as it professes “respect for our sister circuit” (see pp. 26ff).) One practical objection to the present holding would be to wipe out not just administrative decisions made by recess appointees over time (since 1867?) but, presumably, to vacate decisions made by judges appointed this manner. In any case, even things that are self-evident are not always self-executing (to borrow a phrase)—and it is worth remembering that constitutional ambiguities between the branches are normally worked out in practice. Even when the Supreme Court declared that legislative vetoes were unconstitutional, in the 1983 Chadha case, Congress and the president continued to put them into law—because they were too useful a powersharing device to set aside. Likewise one imagines that the last word – and the last recess appointment – is some ways off. Surely, surely, surely it is only a coincidence that Governor Romney was a signatory to that letter. 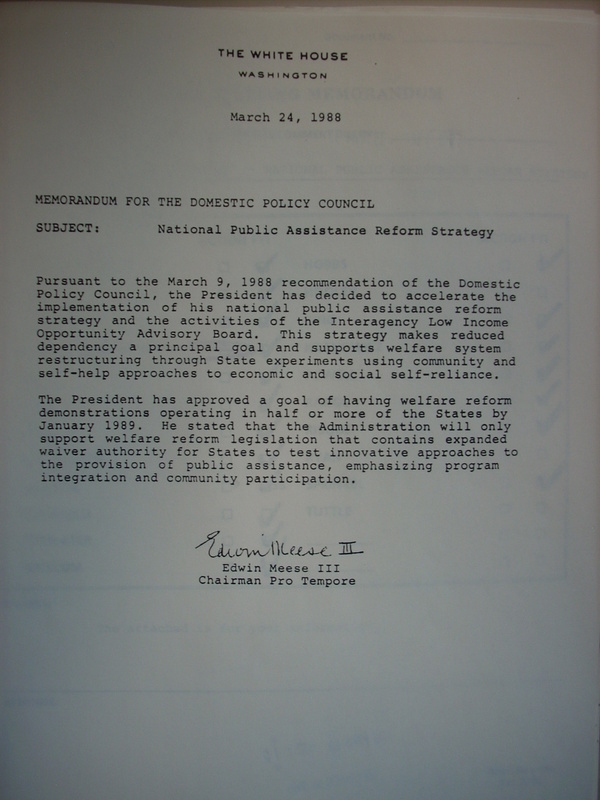 Still, there is a long history of waivers to welfare requirements, as the states take up their “laboratories of democracy” mantle and experiment with different mechanisms for achieving policy goals. 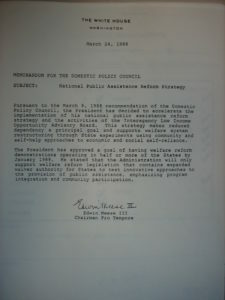 See, for instance, the archival memo below (click on it for a better view) from Reagan attorney general Ed Meese, reporting a 1988 presidential decision to (a) support only welfare reform legislation that enhanced the president’s ability to grant more waivers, and (b) set a goal that half of all the states would receive waivers from federal welfare requirements. Traditionally, of course, Republicans favored more waiver authority, not less, while Democrats were nervous about what states might evade given such autonomy. In the case of No Child Left Behind, the authority to waive provisions of the law is vested in the Secretary by Section 9401 (“Part D – Waivers”). Waivers can be granted, at a state’s request, if it can show that the waivers will “(i) increase the quality of instruction for students; and (ii) improve the academic achievement of students.” In a subsection some portions of NCLB are exempted from the possiblity of waiver – including for instance civil rights requirements, maintenance of effort (to prevent states from making up their own funding cuts with NCLB money), and the NCLB’s funding formulae. But the big-ticket, indeed titular, item—that all students become “proficient” in math and reading by 2014—is not listed there. Thus, in exchange for various policy commitments at the state level, things that the Obama administration thinks will increase the quality of instruction for students and improve their academic achievement, the Ed Department has the authority to waive that burden. So far more than half of all states have sought to do so – Governing magazine provides a useful map here. Waivers certainly provide a given administration with flexibility under what are normally broad statutes where it is difficult to foresee in advance how implementation might play out. (Indeed, Congress presumably did not foresee, in the heady days of 2001, that it would be more than five years late in reauthorizing the Elementary and Secondary Education Act.) Whether they enhance, gut, or simply modify is usually in the eye of the beholder – and whether that beholder likes the policy change in question. Romney himself says he would repeal “Obamacare” on “Day 1”, which in the absence of legislative majorities therefor would presumably include the issuance of waivers to states chafing at the Affordable Care Act’s provisions. Is the issue waivers, then? – or what is waived? PS – a h/t to Jeff Jenkins of UVa for suggesting a post on this topic. This week’s back-and-forth between the House Oversight and Government Reform Committee and the Justice Department over the Operation Fast and Furious gun-tracking (sic) initiative serves as a useful hook for a new report from the good folks at the Miller Center at the University of Virginia. The Center has pulled together scholars in the field to provide an extensive historical overview on executive privilege – as most recently asserted by President Obama to block the provision of deliberative documents to the Committee investigation (see here for a June post thereon). An online exhibition on the topic, with links to the new report and also to a related report of a 1998 task force on the separation of powers, can be accessed here. Enjoy! Just a quick addendum to my post trying to disconnect the president’s recent administrative directive regarding immigration from broader and more dubious assertions of executive unlateralism. The Court’s decision on the Arizona immigration law SB 1070 upheld the notion that federal authorities may and even must make discretionary decisions about who, within the broad class of potentially deportable aliens, should actually be deported. While everyone else is busy rebutting Jacqueline Stevens, I wanted to mention a different piece in the NYT’s Sunday Review: Ross Douhat’s take on “All the President’s Privileges.” Douhat’s basic take is that political partisans switch their views on executive power depending on the party of the executive in question. Thus, Democrats who thought George W. Bush was acting unconstitutionally now think Barack Obama’s assertion of the same powers is just dandy. I have spoken and written (including on this blog, e.g. here) about the ways in which Obama has become quite comfortable with utilizing unilateral authorities that as a candidate he was at best ambivalent about. Two and a half quibbles, though. First, it is hard to argue that the president’s recent administrative directive shifting enforcement priorities within the Department of Homeland Security is a close parallel to the examples Douhat is (rightly) more concerned about, such as the targeted killings of American citizens by drone strike. (Or even the two-faced approach of bragging about the effectiveness of, while denying the existence of, said drones.) The executive privilege assertion, as I noted here, is very much in keeping with claims by a variety of past incumbents (and recent jurisprudence as well.) And the “administrative presidency” literature centers on ways presidents have sought to mold statutory implementation along their preferred lines; Elena Kagan’s mini-epic “Presidential Administration” describes how the last Democratic president did just this. If it is true that presidents’ reading of their mandate to faithfully execute the law has a definition of fidelity drawn from “Mad Men,” there is nonetheless clear discretion delegated to presidents in their enforcement of statute. Further, time matters. A page of history, as Oliver Wendell Holmes said, is worth a volume of logic. And presidents come into office facing a different institutional environment than their predecessors, one shaped by successive precedential actions. Obama, for instance, in searching for guidance in defining “hostilities” within the War Powers Resolution, found a variety of cases in the Reagan (e.g., in the Persian Gulf) and Clinton (in Kosovo) administrations that legal advisers like Harold Koh were bound to take seriously. If Obama chose that history over the logical definition of “hostilities,” then, he was not necessarily being hypocritical – just presidential.